What a brilliant Club day #HockeyFest we had on 17th September starting at Aylesford 12;30 to 17:00 with Rush Hockey mini games, rounders and have a go Segway Polo! 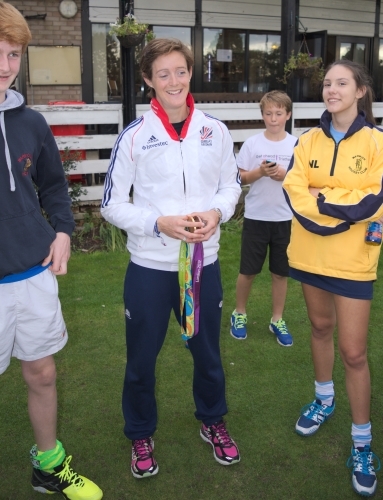 Then back to our Club House to welcome Hannah Macleod, GB Ladies team Olympian. After all the sporting fun we returned to our Club House for the day's highlight; the appearance of Hannah Macleod in her white GB track suit with not one, but two Olympic medals – a bronze from London 2012 and the Gold from Rio 2016. She started off doing an informal walk around speaking with players, families and children a like. 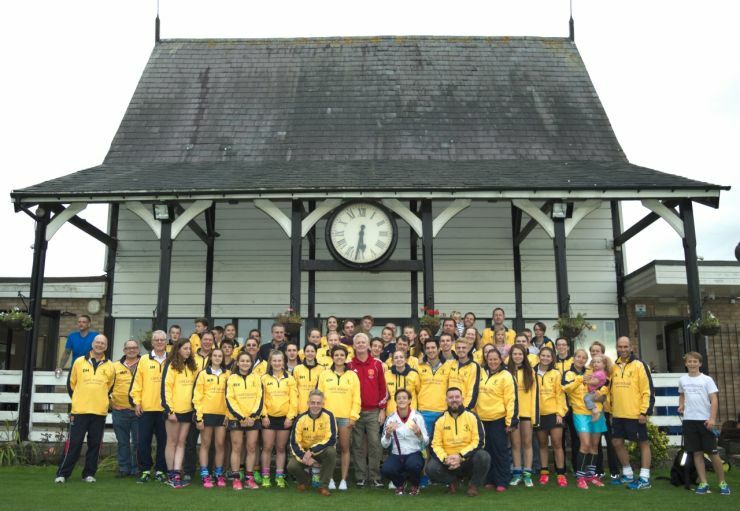 Then came the highlight and biggest moment of the day – a Club wide photograph where all members (from five year olds juniors to 70 year old vets) wore the infamous Yellow Café Rouge Leamington Spa Training Tops which were kindly sponsored by the restaurant chain last year. Back to Club Day… Once the photo session was over, the members were invited back into the newly renovated Warwick Sports Club for a Q&A session with Hannah Macleod. Nick Herd, Club President lead the questions with Hannah sharing amazing insights into her four year training regime, the requirement for her and the other 31 lottery funded squad to remain constant throughout their training and lifestyle habits, whilst based at the England Hockey headquarters at Bisham Abbey, near Maidenhead. Hannah also recounted some of the highs and lows she has experienced, the fallacy about ice baths and how the planning had taken them all the way to winning the gold. But there was no provision made on how they ought to celebrate, let’s leave that to your imagination! Dan Honey-Smith Club Chairman then invited Hannah to award chocolate gold medals to the winning team of the day as she in turn was presented with some flowers and the Club shield enscripted with “You’re our Olympic Gold Medal Hero!”. An appreciation of the fact she had come all the way from playing earlier in the day for her club St Alban’s at Sevenoaks, had driven up to Warwick and was then going on to Kettering later that evening. Hannah was then enticed for a photo shoot and quick demonstration on one of the Warwick Segway Polo machines by Steve Chidlow. Finally, the – Olympic Ring Challenge where five motor cycle tyres (kindly donated from Frettons) had been sprayed gold and placed out in the configuration of the Olympic rings for members, twenty yards away attempting to flick a hockey ball into one of the five rings. As the light faded a winner finally emerged – Andy Griffin, Chief Badger & Ladies 3s & 4s coach, narrowly beating Freddie Herd a new member in his second season at the Club. Hannah was truly great fun, talking informally with us all and willingly being part of what must have been over a hundred selfies, an inspiration to us all. We loved Hannah's tweet, so pleased you enjoyed the day with us too. Hannah left Warwick Hockey Club a superstar and our gold medal heroin after signing yet more sticks, shirts and Club Day leaflets on her way home to Kettering. Thank you Dr. Hannah Macleod and GB #6. Oh, and let's not forget we enjoyed a tasty BBQ, a drink or two from the bar and we held a raffle to raise funds in support of our chosen charity Teenage Cancer Trust. Hope you enjoy scrolling through the selection of photos below with Hannah at our evening Club house events. Thanks to our kit coordinator, Ant Baxter, we had the chance to meet our new kit supplier AKUMA and to try on samples for size. The new kit is similar to the original design, just in a newer material. Many of our members placed orders, and Ant will be arranging another occasion to see and try the new kit for size. Get in touch with Ant by email: kit@warwickhockey.co.uk. Our thanks go to our club day sponsors and contributors to the fund raising raffle, in particular; AKUMA who provided a number of raffle prizes as well as donations, Swirls for the supply of Gelato Italian Ice Cream and Warwick Segway Polo club who generously provided their time and equipment and donated to the raffle. Below are some more snaps from the day, enjoy! All the photos are also available in our Gallery page. 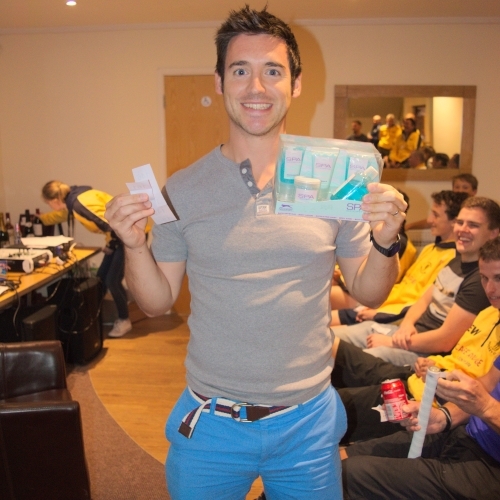 Seb was particularly pleased with his raffle prize, a beauty spa set! Did you know how this all came about? 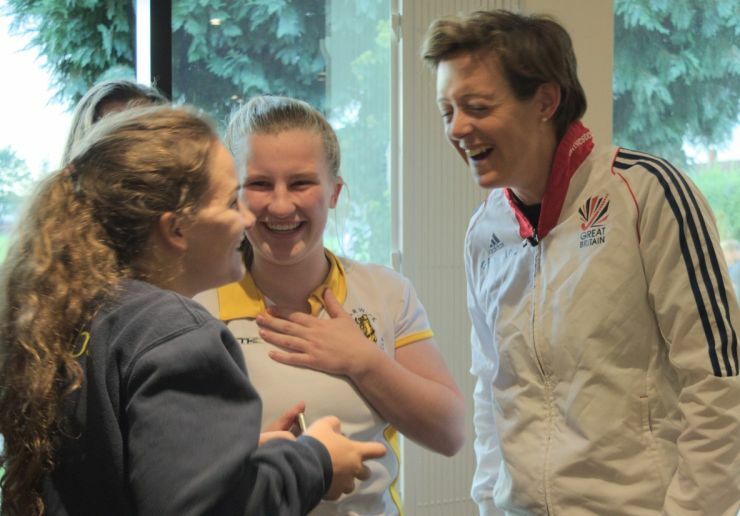 Warwick Hockey Club have been blessed in recent years by appearances from GB Women’s Hockey Olympic medallists visiting their Club Days. 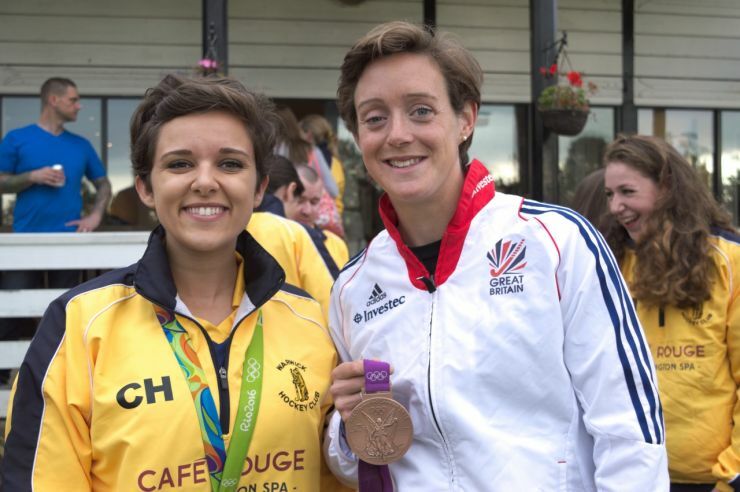 The medal rush started in 2012 after the London Olympic Games when the Club made an audacious play to fly in Sally Walton (bronze medallist) and Anna Turney (Winter Paralympian) straight to their Warwick School pitches. Chris White (Conservative MP), Nick Herd (Chairman) and Steve Chidlow (Secretary) were on hand to greet them and lead them down a tunnel of hockey sticks that the Club members had set. 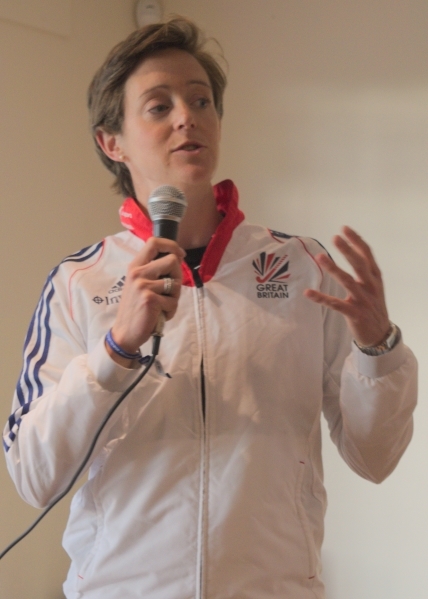 Later Sally addressed the adoring crowd in a Q& A session with Anna and then played in the hockey tournament too. Fast forward to the Rio Olympics 2016 and the amazing achievement of the GB Women’s Hockey team to win a gold medal. 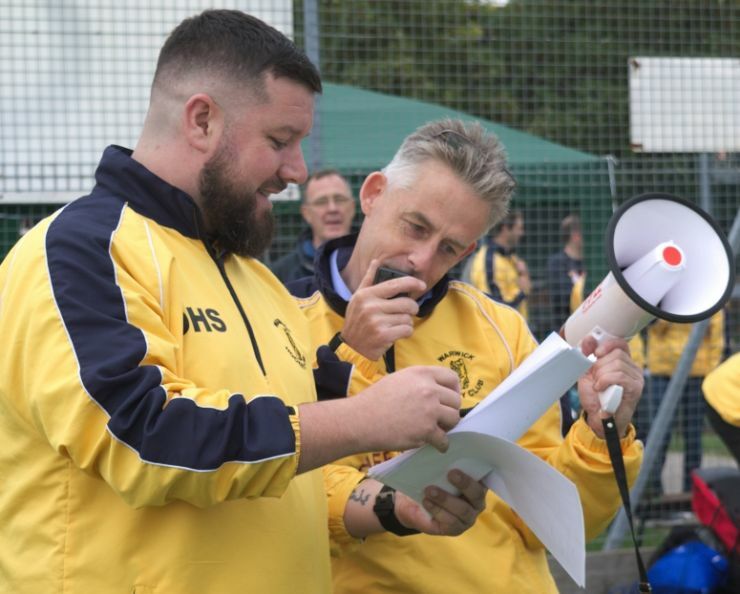 Warwick Hockey Club benefitted from the England Hockey Fest campaign, whereby Clubs are allocated a gold medal winner (part of their media requirements) to come to their Club Day /Hockey Fest celebrations. 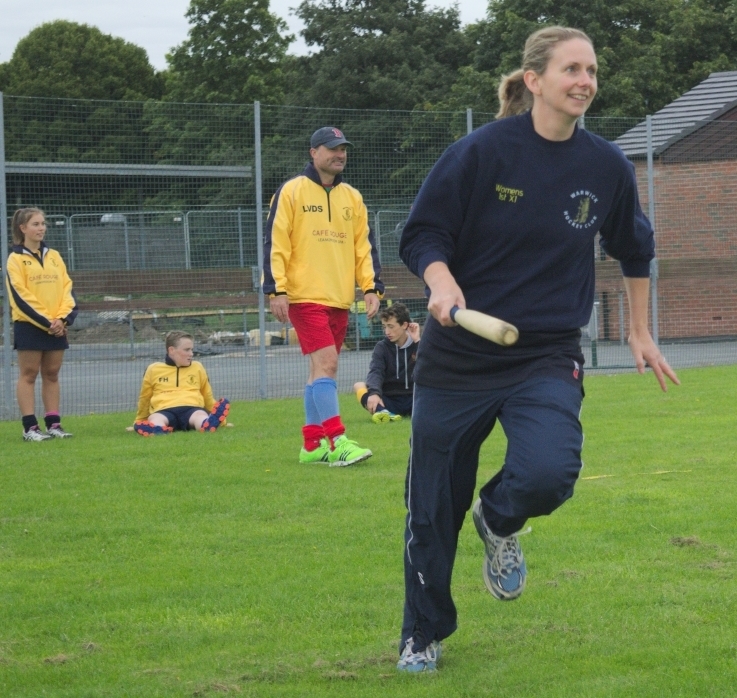 Hannah Macleod was allocated to visit Warwick Hockey Club on Saturday 17th September. We are proud to support Teenage Cancer Trust, please visit their website and find out more and how you can help support them too.